Carey Prior with his second only trout caught on a fly - a woppa 6kg (13lbs). For me night fishing has a charm of its own, especially after a bright and hot day is replaced with the coolness of the night. Under cover of darkness, large trout move into the shallows to gorge themselves on bullies and silveries. Sometimes its presence is indicated by the ever-increasing rings on the surface while others may leap right out of the water chasing their quarry and re-entering with enough force to shatter the stillness of the night. During the day the trout remain uncooperative, probably recovering from the night’s feeding frenzy. A very well conditioned 5lb 5oz brown trout. It’s never that dark that you are unable to spot a familiar landscape silhouetted against the night sky. Yet it’s not possible to see your fly, therefore much of a night fisherman’s skills lie in his fingers. I think that when the trout takes the fly it falls into three categories. The first – a tug on the line calls for an immediate strike. The second – a take so soft that it is easily missed as the trout picks up your fly and swims towards you. What to feel for is the change of tension on the line or rather, the lack of it. Finally – a take so violent that the fish immediately surges into action with the loose line shooting through the guides. Here are a few helpful hints for the prospective night fisher. Complete familiarity with your gear is so important. The way the line feels through the air, the sound it makes as it whistles through the air, as it passes your head. The unusual rustling sound may indicate that the hook has picked up a strand of weed, a leaf or even that the long tail is wrapped around the hook. I have been using a two-metre-long trace of 10lbs breaking strain and a uni-knot to tie on a dropper. This allows the use of two different lures. Having busted off on more occasions than I care to remember by ‘freight train’ trout which left me thinking “how big?” a blob of Araldite on the fly line is a useful indicator to recast. It is so easy to strip in too much and have more line inside the rings than beyond the tip. The return from a few hours night fishing on one of the streams flowing into Lake Ellesmere. Wading at night calls for extreme caution and requires prior inspection of the terrain. 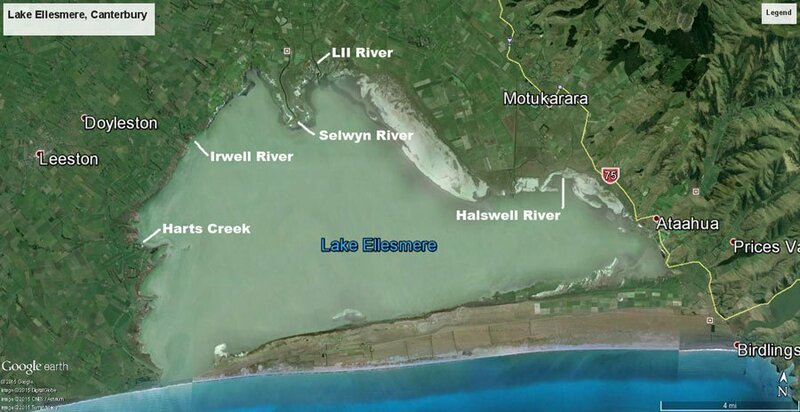 When Lake Ellesmere and Lake Forsyth reach a certain level the Canterbury Regional Council mechanically open these lakes to the sea to lower them. This allows a huge amount of fish to enter the system. 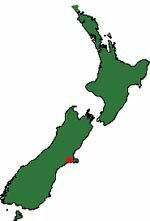 Sea-run trout, silveries, whitebait, flounders, the odd salmon and even the odd shark get trapped when the lake is left to close naturally. As the river level slowly drops, exposing the weed beds close in, I find it necessary to stand at the water’s edge to remain in contact with my flies. The steeples cast is put to good use and yet the tall vegetation still traps the back cast. I always carry two torches as there is little chance of them both failing at the same time. My first torch runs off a rechargeable battery. It may cost a bit more but it eliminates the need for constantly replacing batteries. It provides enough light to locate the track on the way home and to see to change lures. Excessive use of light on the water can create aggro from neighbouring anglers. I had some of my fishing ruined by eel fishermen with their powerful spotlights. There is an extensive range of lures suitable for night fishing. Usually large and bulky they are designed to imitate the smaller fish – bullies and silveries. The general rule – darker the night, darker the lures. For example, for a star-studded night sky a light coloured body (white or yellow) and red or black bodied lures for pitch black nights. Unfortunately with red bodied lures the catch rate of eels increases. It must be the only colour spectrum they can see at night. It’s probably just as well I’d tied my own lures. A landing net is a must, to secure your catch and sometimes to shorten the struggle by several minutes. I favour a telescopic handle with a collapsible net carried in a scabbard. Otherwise, it’s a nuisance when the mesh catches in everything you walk past. However, night fishing does have its ups and downs. On one occasion while walking back from the mouth I heard a loud splash and saw the ever-increasing rings giving away its position. Stripping line off the reel a branch trapped my back cast. Not wanting to turn on my torch and run the risk of putting the light on the water I’d placed my rod beside the bush and ran my hand along the line towards the offending branch. Once freed, I did the opposite, picked up my flyrod and carried on casting. In theory, it should have worked, except for one small detail. I was a lot closer to the edge than I had realised. The strange falling sensation, followed by a huge splash and the cold water, quickly brought me to my senses. That trout must have laughed so much that it stopped feeding. Carey Prior with his second only trout caught on a fly – a woppa 6kg (13lbs). The next night a 7lbs 8 oz brown lay at my feet. On another occasion, while on a track I thought I knew well, a trout rose. In my rush to get into position, I tripped and was in free fall for a split second before a gorse bush broke my fall. The pain of fifty-six thorns entered my hands and legs. ‘Oh yes, I did count them when I dug them out with a pin. 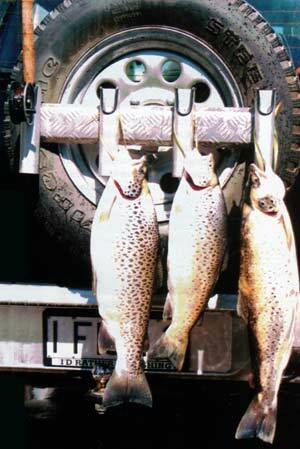 However, the ultimate achievement is a double-figure trophy trout. After twenty plus years I managed not one, but two! 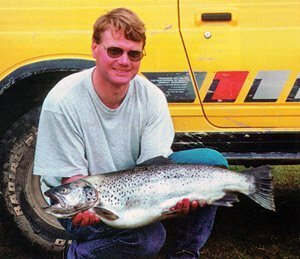 One night in December 1997 I landed four trout with my smallest 7lbs 12oz, and a whopper of 13lbs 14oz. A few days later another double-figure trout of 10 lbs 8oz. My trophy has been mounted by Tyron Southward at the Rakaia Huts.I took Carey Prior, a member of the Ferrymead Fishing Club, to one of the in-flowing rivers of Lake Ellesmere. Carey informed me that he had never caught a trout with a fly. I tied on one of my ‘secret lures’and gave a few instructions on how to fish this river. On his second cast a spirited, well-conditioned brown nailed his lure and I took great pleasure in netting the 3lbs 8oz fish for him. 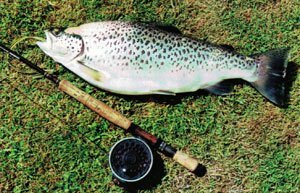 On the way home in the early hours of the morning, I had to ask “What would you do if you landed a trophy?” A moment’s silence before I received the answer “Probably eat it.” A few days later there was a message on my cell phone informing me that a member of our club had landed a monster of a trout. I arrived at the New Brighton Sports Centre to get a few answers. Who caught it and how big? I was kept in suspense with the only answer I got being “It was huge.” Moments later another call from the successful angler – Carey. I didn’t care if I was a bit late for work – I had to see the fish. Carey’s second fish on the fly was a whopper – 72cms long and weighing 5.9kg (13lbs). With a smile on his face, the excited Carey said it all as he described the cast, the take, the tug of war that followed between the fish and himself, and how he netted this monster in a net that was far too small. Lake Ellesmere map showing Harts Creek, Irwell River, LII, Selwyn River, and the Halswell River. Map courtesy of GoogleEarth, Astrium, and Digital Globe.